Home > In the News > Please “Give a Sh!rt” for New Brunswickers, and for our environment! Please “Give a Sh!rt” for New Brunswickers, and for our environment! Have you ever thought about the impact your clothing has on the environment, and could have for people in New Brunswick? If so, would you “give a sh!rt”? Consider this. It takes 1800 gallons of water to make just one pair of jeans. And it takes another 700 gallons to make a t-shirt. No wonder the clothing industry is now the world’s second biggest polluter! Then there’s the fact that a staggering 85% of our collective apparel ends up in a landfill, and 95% of clothes that get thrown away could be reused or recycled. With the average person throwing away about 81 pounds of cloth items every year, in Canada our discarded clothing and cloth would make a pile of textiles at least three times the size of Toronto’s Rogers Centre stadium. That’s a considerable environmental impact, and something to “give a sh!rt” about. 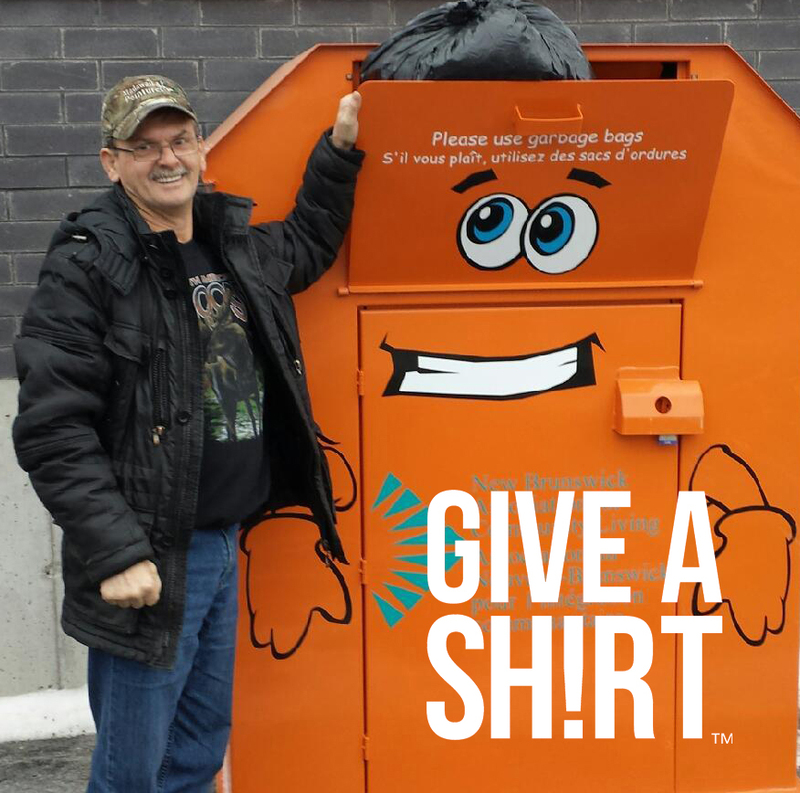 Fortunately, here in New Brunswick there’s a way to see that your unwanted jeans, t-shirts, and other apparel, accessories, linens and small household items are reused and recycled. And even better, those discarded goods can also make a positive impact for people right here in New Brunswick. 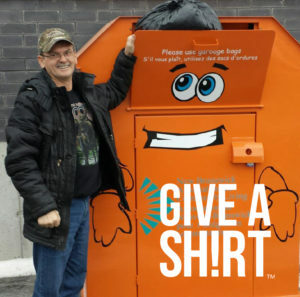 That, too, is something to “give a sh!rt,” about, which is exactly what the New Brunswick Association for Community Living (NBACL) is asking you to do for our “Give a Sh!rt” campaign again this year. In New Brunswick, there are over 20,000 people who have an intellectual disability. Many – as a matter of fact, most – live in poverty and social isolation due to lack of supports and employment opportunities. NBACL is the non-profit organization that works to support children and adults in this province who have an intellectual disability, and their families, so that they’re able to live, learn, work and actively participate in their communities as valued and contributing citizens. Here’s how the “Give a Sh!rt” campaign works. We’re not really asking for the shirt off your back, of course, just the ones that you don’t want anymore. We’re also keen on your old jeans, are starving for scarves, will take leather and sweaters, jackets and rackets, boots and toques, and wouldn’t mind at all if you ‘sock’ it to us! All you have to do is look through your closets, dressers and storage and pull out all of the items you don’t need or want anymore: clothes, linens, footwear, accessories, toys, small household items, etc. Then put it all in garbage bags and drop the bags into one of the big orange bins (we call them BOBs) in your community, or call us for a pick-up. That’s it! From there, we take your bags of donations and turn them into cash through an arrangement with our long-time partner, Value Village. That cash is then used to help kids and adults with an intellectual disability to be supported and included in their child care centres and schools, right through to their transition to higher education, the workplace and independent living. It’s that easy! And consider the impact! Through the “Give a Sh!rt” campaign you’ll significantly reduce your textile footprint! As a matter of fact, each year NBACL’s Community Collection Program keeps about 3,000,000 pounds of cloth and other materials out of provincial landfills, much of which ends up as thrifty choices for New Brunswick shoppers! And then there are the people who need NBACL’s support. With every $1500 raised through our “Give a Sh!rt” campaign, we would be able to help one more New Brunswicker with an intellectual disability receive the supports they need to be included in their community and have an ordinary life, just like you. Who knew that those no-longer-wanted clothes, linens and other items you’ve been hanging onto could have such an impact on the environment and on the lives of New Brunswickers! 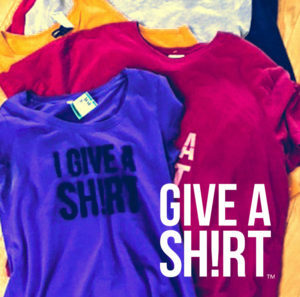 For information on NBACL’s “Give a Sh!rt” campaign, check out our website, www.nbacl.nb.ca. Info and arrangements for donation pick-up are also available by calling us at 1-866-NBACL4U (1-866-622-2548). Want to see how easy it is to “Give a Sh!rt”? Check out this fun video featuring NBACL’s fabulous summer students Taylor Williams and Jonathan Gallagher!